We're most impressed by the contrasts of Bahrain. The capital city of Manama is as sleek and modern as they come, with glittering shopping malls and Formula 1 racing just the tip of its jet-set appeal. Go ahead and shop 'til you drop, if that's your thing. But do save some time and energy for the country's cultural and historical riches. One of the world's oldest advanced civilizations, the Dilmum civilization, had its capital here. The 6th century Bahrain Fort sits atop multiple layers of habitation going back over 5,000 years. Artefacts from the site and others are on display in the exceptional National Museum. 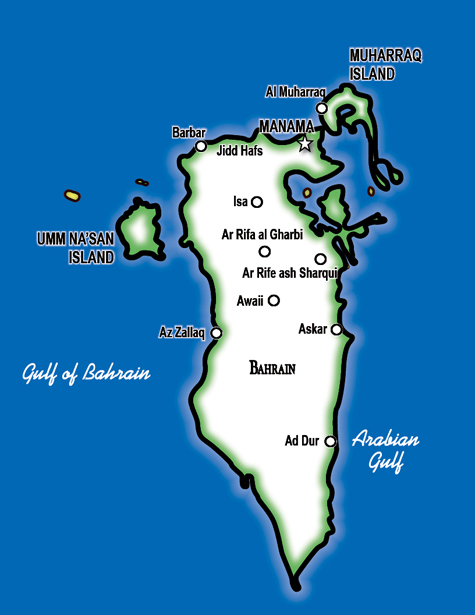 Bahrain is an island country near the western shores of the Persian Gulf. Saudi Arabia lies to the west and is connected to Bahrain by the King Fahd Causeway. Other neighbors are - Iran, 200 km (120 mi) across the Gulf to the north and the peninsula country of Qatar, to the southeast across the Gulf of Bahrain. Manama is Bahrain’s capital and largest city, with a population of around 170,000. Bahrain is a very safe country in general but be careful crossing the street! The country has a very high pedestrian death rate. Bahrain is known to be more socially liberal and generally more open than its neighbors. Bahrain’s attractions range from ancient to ultra-modern. Remains of ancient settlements, temples and burial mounds around the country may have been left by the Dilmun civilization, an important trade link between Mesopotamia and the Indus Valley. The island is home to many castles, including Bahrain Fort, also known as the Portuguese Fort near Karranah, on the northern coast of Bahrain Island. The fort has been listed by UNESCO as a World Heritage Site. The excellent National Museum holds exhibits on 7000 years of Bahraini history. Perhaps Bahrain’s biggest tourist draw is its shopping, whether in a traditional souk or a shiny new mall, there are lots of opportunities to spend money.